Youtube, MySpace Video and Google Video are probably the most popular video sharing website but with a small problem - you cannot access videos favorited in one service from another. For instance, you can add videos to your Youtube playlist but that video list won't be accessible from MySpace or Google Videos (and vice versa). That's where Lycos Mix steps in. Lycos Mix is a free video bookmarking service where you select favorite videos from Youtube, Google or MySpace and create a common playlist accessible from one central location. No big deal, right ? The USP of Lycos Mix is that you can even invite friends and like-minded people to grow your video list by contributing their own favorite videos - quite useful when you are working as a team on some project. And there an option to live chat with users who are also watching the same video mix. 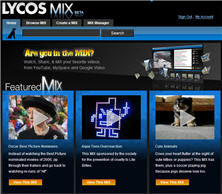 Lycos provides a simple bookmarklet (MIX IT) to ease the process of adding new videos to your Lycos Mix account.